Back at the start of this series of posts on cult crime writer Peter Rabe, I mentioned that Rabe is the uncrowned king of the pulpy paperback novel. 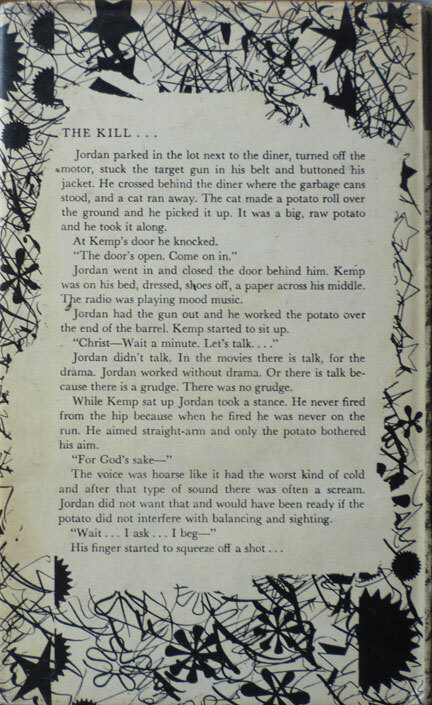 Like John D. MacDonald and Jim Thompson, the paperback was both Rabe's natural home and a format that sidelined him unfairly. 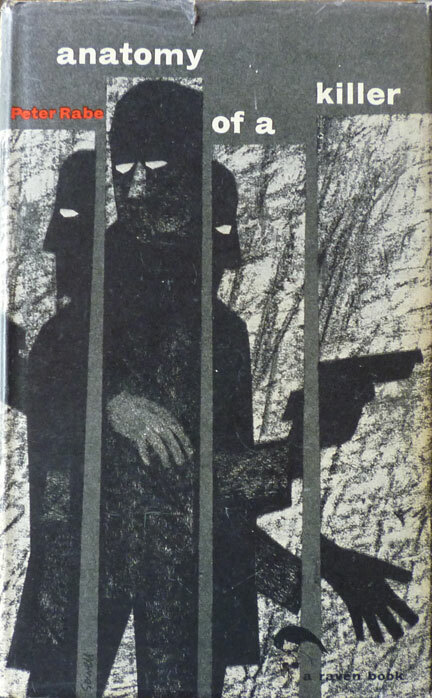 Because, also like MacDonald and Thompson and a select few others, while the paperback format seemed to suit his stories of gangsters and bad men and lowlifes, Rabe's writing was a cut above that of his fellow softback hacks. MacDonald and Thompson both had novels published in hardback in their lifetimes, however. Only a handful in Thompson's case, mostly at the beginning of his career, but that's still more than Rabe. Peter Rabe only made it into hardback three times in his lifetime (and, I think, only once after he died, thus far anyway). The first time was in 1955, when Vanguard in the US and Frederick Muller in the UK published his little-remarked-upon non-fiction title From Here to Maternity, a humorous look at the birth of his first son, complete with line drawings by the author. The last time was in 1967, when Herbert Jenkins in the UK issued a hardback of his earlier Gold Medal paperback My Lovely Executioner; I was hoping to be able to show the Herbert Jenkins edition, but like the paperback of Time Enough to Die I mentioned yesterday, the copy I ordered has vanished in the post. ...[had] honed his nerves down to a fine, taut edge and turned himself into a ruthless precision machine for killing—a cold-blooded automaton who dealt out controlled violence. He had this trick on a job of splitting himself in two—head over here, guts over there in a box—and that way everything went off smoothly and efficiently. That way there were no feelings, because Jordan couldn't afford them. When he was done in the room he stepped away quickly because the other man was falling his way. He moved fast and well and when he was out in the corridor he pulled the door shut behind him. Sam Jordan's speed had nothing to do with haste but came from perfection. He relaxed immediately but his motion was interrupted because he had to turn towards the end of the hall. The old woman had not stepped all the way out of her room. She was stretching her neck past the door jamb and looking at him. "Did you hear a noise just now?" "Yes." He walked toward her, which was natural, because the stair well was that way. "on the street," he said. "One of those hotrods." "Did you just come from Mister Vendo's room?" "Was he in? I mean, I wonder if he heard it." "Yes. He's in, and he heard it." Jordan walked by the old woman and started down the stairs. She shook her head and said, "That racket. They're just like wild animals, the way they're driving," and went back into her room. He turned when her door shut and walked back down the hallway. This was necessary and therefore automatic. He did not feel like a wild animal. He did his job with all the job habits smooth. When he was back at the door he looked down at the arm, but then did nothing else. He stood there with his hand on the door knob and did nothing. 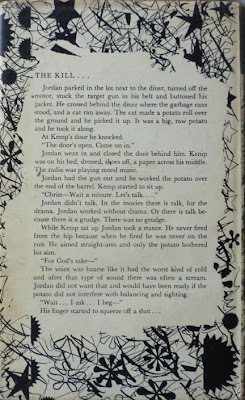 The terse dialogue, the short, plain, sentences: that's a Parker in all but name. Stark House Press brought Anatomy of a Killer back into print in 2008 as a double-novel with A Shroud for Jesso, so should you wish to make your own Parker comparisons, you don't have to go to the trouble of getting an expensive (anything from thirty to a hundred quid for a nice copy) first edition to do so. The dustjacket on the Abelard-Schuman edition was designed by the late John Sewell, who was rather an interesting man in his own right. 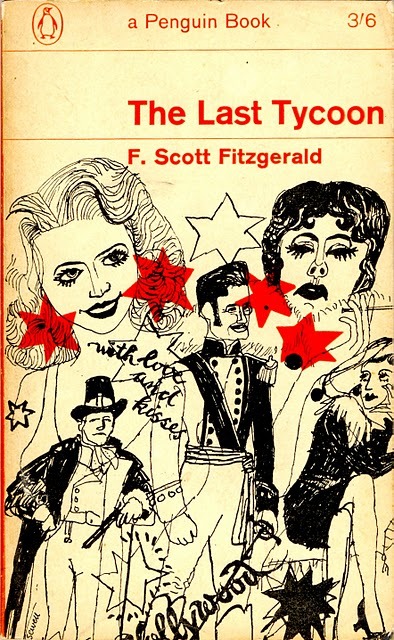 He created quite a lot of covers for Penguin, including F. Scott Fitzgerald's Tender is the Night and The Last Tycoon. He also made short films. In 1954 he became the first graphic designer to be recruited by the BBC, and headed up a whole department creating screen graphics in the 1950s, although little of his work survives. 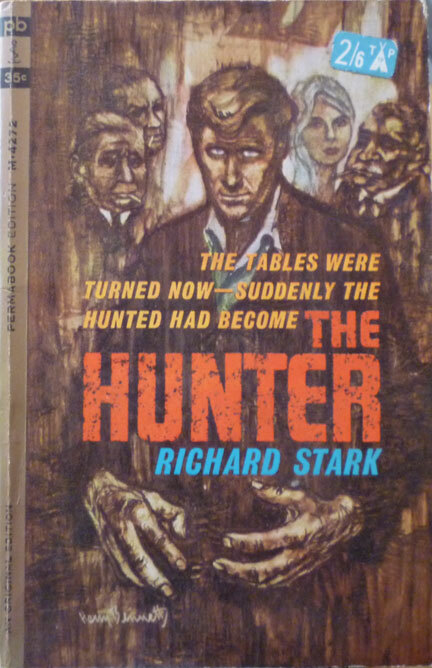 There's an appreciation of his book cover work on this blog. His jacket for Anatomy of a Killer is typical of his scratchy illustration and cut-up design style; it certainly makes a change from the more lurid efforts on the Gold Medal paperbacks of Rabe's novels. And that's about it for this series of posts on Peter Rabe – at least until the two books I ordered that have gone AWOL turn up, anyway. Great stuff. I appreciated the whole week. I really need to up my focus on Peter Rabe. I think I've only read one of his books since I started blogging. The main reason is that they are just so hard to find. But it sounds like it is getting easier. And wow does that prose ever sound like Parker! Doesn't it just? Stark House Press have published a handful of those Rabe double-novels now; you should be able to find a reasonably priced copy of one or the other of 'em.